The Hen Harrier is one of, if not the most elegant and graceful, spectacular and exciting birds in the world. It is an asset to the life, biodiversity and heritage of any country in which it is found. In Ireland, the Hen Harrier is a rare Bird of Prey, found on the uplands during the breeding season throughout the spring and summer, and generally on the lowlands during the autumn and winter. One of the most striking things about the bird is that the male and female differ remarkably in size and colour, so much so, that for many years, the two were thought to be separate species! The male is a stunning looking white or silver bird with a bluish tinge, and broad black tips to the wings. The female is a larger bird of a beautiful rich brown plumage with a white rump and brown and white barring or rings on the tail. The white rump on the back of the tail is very important in being sure if it is a Hen Harrier. There are other brown birds of prey in Ireland (e.g. Kestrel and Sparrowhawk) but only the Hen Harrier has the white rump and holds its elegant wings out fully when gliding/flying. 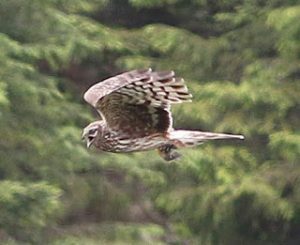 Also, Hen Harriers are more likely to be seen flying low over the ground than the other birds of prey. The male is unmistakeable, no other bird of prey in Ireland looks like him. It is interesting to learn that males are brown when young. This gives them camouflage in the nest. They begin to turn white when they are 1 year old onwards. The Hen Harrier is found mostly in just the South and Mid West of the country, with a few pairs in the midlands and North West. Its breeding distribution has declined over the years. In many areas where it was once common e.g. Wicklow, it is now extinct because of habitat loss such as afforestation. The reason these areas, including the Slieve Aughties, are so important is because of the special mix of farmland and bogs. This provides the Hen Harrier with the habitat which it needs to live. Forestry is good for the harriers when the trees are small but when the trees grow up, it blocks out the ground and the harrier cannot fly between the trees. Too much forestry will mean that the harrier’s habitat is lost for the 30 years when it is tall. We have to be careful to save our farmland and bogs and be careful about how forestry is managed so as not to have too much tall forestry at the one time. Copyright © 2019 Slieve Aughty Mountain Adventures All Rights Reserved.